Many naturalistas and product junkies everywhere know about and have generally used shea butter but few have actually heard or used mango butter. Mango butter is a great substitute for those who are allergic to shea butter due to its natural latex content. Like shea, mango butter has emollient properties, thus helping to soften the hair and seal in moisture. It also contains high levels of antioxidants and beneficial vitamins A, C, and E. Just 1 cup of mango can provide you with 80% of your daily vitamin C intake and 25% of vitamin A. It has been proven that vitamins A and C have a direct influence on hair growth making this ingredient a very important contributor to healthy hair. This natural butter also helps shield against harmful UV rays protecting both the hair and scalp from potential sun damage, making it an extremely effective sunscreen for the hair. Mango butter is also a better sealant to use in the winter time because it does a better job at sealing oils within the hair than shea butter. This tidbit of information is one of the first things that stood out to me when researching mango butter. And mango butter does not disappoint in this area BUT I find it helpful to use mango AND shea butter in a DIY treatment in order to acheive maxiumum sealing. 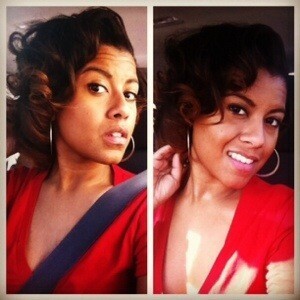 The winter time can be especially harsh on hair. I mean, think about it! You’re coming from cold air into hot air when coming back and forth from inside, zapping moisture from your hair. You’re also wearing thicker fabrics, such as wool, that cause breakage and snagging of the ends and lower layers of hair (near your nape) that can affect length retention. Major no no! I also found a YouTube video that does a great job at explaining the wonders of mango butter and how to make your own recipe! When purchasing a natural butter, it is important to look for a butter that is extracted using natural methods to ensure maximum nourishment to the skin. Look for the words “unrefined,” “cold-pressed” or “crude.” This means that the product was extracted from the shea nut, cocoa bean or mango using natural methods that don’t overheat the ingredient during the process, thus destroying some of its nutrients. 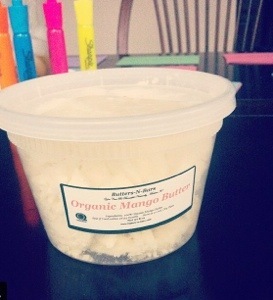 One of my sisters told me about this great website called Butters-N-Bars that I use to order natural butters and essentials oils from and this is where I ordered my mango butter (pictured below) from! I highly recommend this website.